9. Ford Iosis Max | What Car? 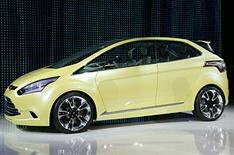 This is the Ford Iosis Max small family car concept. Ford, which describes the car as a Multi-Activity Vehicle (MAV), is at pains to stress that the Iosis Max isn't a forerunner to any production model. However, this is the third Iosis concept car built by Ford, the first showing the next Mondeo and the second became the Kuga. As a result, given the Iosis Max's size and shape, it is inevitable it will be seen by many as a forerunner to both a Ford C-Max and Ford Focus replacement. The new C-Max is due in 2010, while the Focus will be replaced in 2011. However, as well as the C-Max and Focus, it is anticipated that many of the features will be used on future models across the entire Ford range. The Iosis Max is powered by a 177bhp 1.6-litre turbo-charged petrol engine, which will go in production cars in 2010. It is marketed under the Ecoboost banner, which is applied to a new range of Ford engines that are turbocharged and use direct injection technology to deliver up to 20% better fuel economy than conventional petrol engines with the same power output. It is coupled to Ford's fuel-saving semi-automatic PowerShift gearbox, which is already used in the Focus, and a new engine stop-start system that will go into selected models from 2010. Other fuel-saving devices include electric power steering and an intelligent alternator, which draws power from the battery only when required. Simulations suggest that the car will emit around 125g/km of CO2. Other innovative aspects of the Iosis Max concept car are being evaluated for use on future Fords. These include the two-piece boot lid, which allows the tailgate to be opened even in a confined space, and the bonnet opening system, which offers greater pedestrian crash protection. The Iosis Max also features many neat design touches that hint at goals Ford is trying to achieve, but which are unlikely to make production. For instance, the 'flying buttress' style pillars in the middle of the car are designed to channel airflow as close as possible to the tailgate, improving aerodynamic efficiency. While the pillars are unlikely to make production, Ford is intent on making all future models as aerodynamic as possible, helping to reduce fuel consumption and CO2 emissions. The push towards lightweight construction methods is also shown by the widespread use of transparent materials. While the huge amount of glass around the car will never make it into production, it is intended to give people looking at the car an impression of its lightness. Likewise, having seats suspended from the car's central transmission tunnel rather than secured to the floor hints at future weight-saving plans, as does the fact that the seats are made of carbonfibre, allowing them to be as strong as traditional seats but far lighter. Inside the car, the centre console has a plexiglass surface, with a touchscreen display. Such technology is thought to be already in development. Why it's so good There's an intriguing mix of production reality and far-fetched dreams involved in the creation of this car. It bodes well for the future.